All classes offered are perfect for the novice as well as the experienced woodworker and are limited in size to ensure personal one-one-one instruction in an enjoyable environment of camaraderie. Richard Grell invites you to the ultimate Windsor chairmaking experience at his Woodworking Workshop. Retreat from the stress and noise of modern day life and join him as you experience the mystique of hand-crafting Windsor chairs. At your arrival, the very materials that comprise Windsor chairs: maple, oak and tulip poplar trees, greet you. Century old, traditional chairmaking tools adorn the walls inside the workshop and intimate classroom setting. Learn to carve, steam bend and whittle, through unique instructional methods and Richard’s undeniable lore of Windsor crafting. Enjoy a savory lunch in the beautifully sunlit loft, while you relish in humorous and personal anecdotes from Richard’s 40 years of craftsmen experience. Marvel at the structural integrity and unmatched design of the Windsor chair, crafted by you. 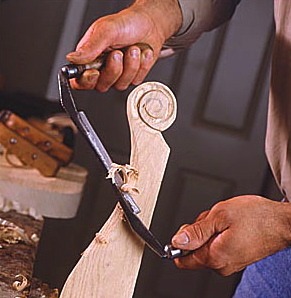 Complete the day with an overwhelming sense of pride, from crafting a Windsor chair by your own hands. Leave with a newly found artistry and a family heirloom that will bring joy to your child or grandchild’s eyes, spanning generations to come.